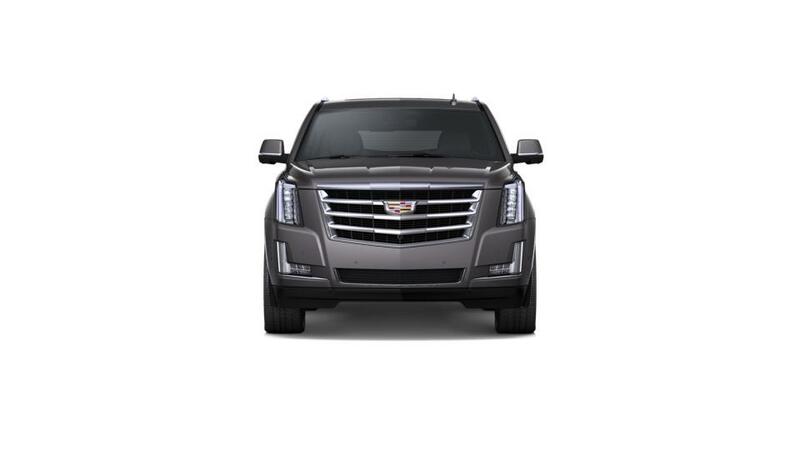 Still Searching for a new Cadillac Escalade ESV Near Overland Park or Olathe? Finance for $1,460 per month at 3.9% APR for 60 months with $9,047 down payment. Payment expires on 04/30/19. Estimated Finance payment based upon 3.9% APR for 60 months, with a down payment of $9,047. Excludes title, taxes, registration, and license fees. Some customers will not qualify. See your authorized dealer for complete details on this and other offers. Residency restrictions may apply. Lease for $1,029/month for 39 months with $9,047 due at signing including $0 Security Deposit and 10,000 miles per year. Payment expires on 04/30/19. Estimated Lease payment based on 39 months and $9,047 due at lease signing. Cash due at signing includes $8,019 capitalization cost reduction, which includes $650 acquisition fee, plus a required security deposit of $0, and first month's lease payment of $1,029. Excludes title, taxes, registration, and license fees. Total monthly payments equal $48,114. Mileage charge of $0.25 per mile over 10,000 miles. Not all consumers will qualify. Residency restrictions may apply. Finance for $1,495 per month at 3.9% APR for 60 months with $9,261 down payment. Payment expires on 04/30/19. Estimated Finance payment based upon 3.9% APR for 60 months, with a down payment of $9,261. Excludes title, taxes, registration, and license fees. Some customers will not qualify. See your authorized dealer for complete details on this and other offers. Residency restrictions may apply. Lease for $1,054/month for 39 months with $9,261 due at signing including $0 Security Deposit and 10,000 miles per year. Payment expires on 04/30/19. Estimated Lease payment based on 39 months and $9,261 due at lease signing. Cash due at signing includes $8,208 capitalization cost reduction, which includes $650 acquisition fee, plus a required security deposit of $0, and first month's lease payment of $1,054. Excludes title, taxes, registration, and license fees. Total monthly payments equal $49,288. Mileage charge of $0.25 per mile over 10,000 miles. Not all consumers will qualify. Residency restrictions may apply. Finance for $1,531 per month at 3.9% APR for 60 months with $9,480 down payment. Payment expires on 04/30/19. Estimated Finance payment based upon 3.9% APR for 60 months, with a down payment of $9,480. Excludes title, taxes, registration, and license fees. Some customers will not qualify. See your authorized dealer for complete details on this and other offers. Residency restrictions may apply. Lease for $1,187/month for 39 months with $9,480 due at signing including $0 Security Deposit and 10,000 miles per year. Payment expires on 04/30/19. Estimated Lease payment based on 39 months and $9,480 due at lease signing. Cash due at signing includes $8,294 capitalization cost reduction, which includes $650 acquisition fee, plus a required security deposit of $0, and first month's lease payment of $1,187. Excludes title, taxes, registration, and license fees. Total monthly payments equal $54,557. Mileage charge of $0.25 per mile over 10,000 miles. Not all consumers will qualify. Residency restrictions may apply. Finance for $1,550 per month at 3.9% APR for 60 months with $9,594 down payment. Payment expires on 04/30/19. Estimated Finance payment based upon 3.9% APR for 60 months, with a down payment of $9,594. Excludes title, taxes, registration, and license fees. Some customers will not qualify. See your authorized dealer for complete details on this and other offers. Residency restrictions may apply. Lease for $1,202/month for 39 months with $9,594 due at signing including $0 Security Deposit and 10,000 miles per year. Payment expires on 04/30/19. Estimated Lease payment based on 39 months and $9,594 due at lease signing. Cash due at signing includes $8,393 capitalization cost reduction, which includes $650 acquisition fee, plus a required security deposit of $0, and first month's lease payment of $1,202. Excludes title, taxes, registration, and license fees. Total monthly payments equal $55,233. Mileage charge of $0.25 per mile over 10,000 miles. Not all consumers will qualify. Residency restrictions may apply. Finance for $1,569 per month at 3.9% APR for 60 months with $9,710 down payment. Payment expires on 04/30/19. Estimated Finance payment based upon 3.9% APR for 60 months, with a down payment of $9,710. Excludes title, taxes, registration, and license fees. Some customers will not qualify. See your authorized dealer for complete details on this and other offers. Residency restrictions may apply. Lease for $1,216/month for 39 months with $9,710 due at signing including $0 Security Deposit and 10,000 miles per year. Payment expires on 04/30/19. Estimated Lease payment based on 39 months and $9,710 due at lease signing. Cash due at signing includes $8,495 capitalization cost reduction, which includes $650 acquisition fee, plus a required security deposit of $0, and first month's lease payment of $1,216. Excludes title, taxes, registration, and license fees. Total monthly payments equal $55,918. Mileage charge of $0.25 per mile over 10,000 miles. Not all consumers will qualify. Residency restrictions may apply. Finance for $1,653 per month at 3.9% APR for 60 months with $10,219 down payment. Payment expires on 04/30/19. Estimated Finance payment based upon 3.9% APR for 60 months, with a down payment of $10,219. Excludes title, taxes, registration, and license fees. Some customers will not qualify. See your authorized dealer for complete details on this and other offers. Residency restrictions may apply. Lease for $1,291/month for 39 months with $10,219 due at signing including $0 Security Deposit and 10,000 miles per year. Payment expires on 04/30/19. Estimated Lease payment based on 39 months and $10,219 due at lease signing. Cash due at signing includes $8,929 capitalization cost reduction, which includes $650 acquisition fee, plus a required security deposit of $0, and first month's lease payment of $1,291. Excludes title, taxes, registration, and license fees. Total monthly payments equal $59,266. Mileage charge of $0.25 per mile over 10,000 miles. Not all consumers will qualify. Residency restrictions may apply. Finance for $1,596 per month at 3.9% APR for 60 months with $9,648 down payment. Payment expires on 04/30/19. Estimated Finance payment based upon 3.9% APR for 60 months, with a down payment of $9,648. Excludes title, taxes, registration, and license fees. Some customers will not qualify. See your authorized dealer for complete details on this and other offers. Residency restrictions may apply. Lease for $1,263/month for 39 months with $9,648 due at signing including $0 Security Deposit and 10,000 miles per year. Payment expires on 04/30/19. Estimated Lease payment based on 39 months and $9,648 due at lease signing. Cash due at signing includes $8,385 capitalization cost reduction, which includes $650 acquisition fee, plus a required security deposit of $0, and first month's lease payment of $1,263. Excludes title, taxes, registration, and license fees. Total monthly payments equal $57,639. Mileage charge of $0.25 per mile over 10,000 miles. Not all consumers will qualify. Residency restrictions may apply. Finance for $1,680 per month at 3.9% APR for 60 months with $10,159 down payment. Payment expires on 04/30/19. Estimated Finance payment based upon 3.9% APR for 60 months, with a down payment of $10,159. Excludes title, taxes, registration, and license fees. Some customers will not qualify. See your authorized dealer for complete details on this and other offers. Residency restrictions may apply. Lease for $1,339/month for 39 months with $10,159 due at signing including $0 Security Deposit and 10,000 miles per year. Payment expires on 04/30/19. Estimated Lease payment based on 39 months and $10,159 due at lease signing. Cash due at signing includes $8,821 capitalization cost reduction, which includes $650 acquisition fee, plus a required security deposit of $0, and first month's lease payment of $1,339. Excludes title, taxes, registration, and license fees. Total monthly payments equal $61,019. Mileage charge of $0.25 per mile over 10,000 miles. Not all consumers will qualify. Residency restrictions may apply. Finance for $1,570 per month at 3.9% APR for 60 months with $10,159 down payment. Payment expires on 04/30/19. Lease for $1,256/month for 39 months with $10,159 due at signing including $0 Security Deposit and 10,000 miles per year. Payment expires on 04/30/19. Estimated Lease payment based on 39 months and $10,159 due at lease signing. Cash due at signing includes $11,904 capitalization cost reduction, which includes $650 acquisition fee, plus a required security deposit of $0, and first month's lease payment of $1,256. Excludes title, taxes, registration, and license fees. Total monthly payments equal $60,855. Mileage charge of $0.25 per mile over 10,000 miles. Not all consumers will qualify. Residency restrictions may apply. Finance for $1,540 per month at 3.9% APR for 60 months with $9,314 down payment. Payment expires on 04/30/19. Estimated Finance payment based upon 3.9% APR for 60 months, with a down payment of $9,314. Excludes title, taxes, registration, and license fees. Some customers will not qualify. See your authorized dealer for complete details on this and other offers. Residency restrictions may apply. Lease for $1,114/month for 39 months with $9,314 due at signing including $0 Security Deposit and 10,000 miles per year. Payment expires on 04/30/19. Estimated Lease payment based on 39 months and $9,314 due at lease signing. Cash due at signing includes $8,200 capitalization cost reduction, which includes $650 acquisition fee, plus a required security deposit of $0, and first month's lease payment of $1,114. Excludes title, taxes, registration, and license fees. Total monthly payments equal $51,629. Mileage charge of $0.25 per mile over 10,000 miles. Not all consumers will qualify. Residency restrictions may apply. Finance for $1,497 per month at 3.9% APR for 60 months with $9,054 down payment. Payment expires on 04/30/19. Estimated Finance payment based upon 3.9% APR for 60 months, with a down payment of $9,054. Excludes title, taxes, registration, and license fees. Some customers will not qualify. See your authorized dealer for complete details on this and other offers. Residency restrictions may apply. Lease for $1,083/month for 39 months with $9,054 due at signing including $0 Security Deposit and 10,000 miles per year. Payment expires on 04/30/19. Estimated Lease payment based on 39 months and $9,054 due at lease signing. Cash due at signing includes $7,971 capitalization cost reduction, which includes $650 acquisition fee, plus a required security deposit of $0, and first month's lease payment of $1,083. Excludes title, taxes, registration, and license fees. Total monthly payments equal $50,206. Mileage charge of $0.25 per mile over 10,000 miles. Not all consumers will qualify. Residency restrictions may apply. Finance for $1,422 per month at 3.9% APR for 60 months with $9,261 down payment. Payment expires on 04/30/19. Lease for $1,027/month for 39 months with $9,261 due at signing including $0 Security Deposit and 10,000 miles per year. Payment expires on 04/30/19. Estimated Lease payment based on 39 months and $9,261 due at lease signing. Cash due at signing includes $11,235 capitalization cost reduction, which includes $650 acquisition fee, plus a required security deposit of $0, and first month's lease payment of $1,027. Excludes title, taxes, registration, and license fees. Total monthly payments equal $51,260. Mileage charge of $0.25 per mile over 10,000 miles. Not all consumers will qualify. Residency restrictions may apply. Finance for $1,477 per month at 3.9% APR for 60 months with $8,932 down payment. Payment expires on 04/30/19. Estimated Finance payment based upon 3.9% APR for 60 months, with a down payment of $8,932. Excludes title, taxes, registration, and license fees. Some customers will not qualify. See your authorized dealer for complete details on this and other offers. Residency restrictions may apply. Lease for $1,069/month for 39 months with $8,932 due at signing including $0 Security Deposit and 10,000 miles per year. Payment expires on 04/30/19. Estimated Lease payment based on 39 months and $8,932 due at lease signing. Cash due at signing includes $7,863 capitalization cost reduction, which includes $650 acquisition fee, plus a required security deposit of $0, and first month's lease payment of $1,069. Excludes title, taxes, registration, and license fees. Total monthly payments equal $49,539. Mileage charge of $0.25 per mile over 10,000 miles. Not all consumers will qualify. Residency restrictions may apply. Learn more about the new Cadillac Escalade ESV at Cable Dahmer Cadillac of Kansas City. Call 888-202-4773 or visit us near Overland Park, Olathe, and Lee's Summit to test-drive a new Cadillac Escalade ESV today.